Our Under 4, 5 and 6 Development sessions cater for children aged 3, 4 and 5 and teach the basics skills required for football. During the summer months, both weekly sessions will be outdoors on the Heys Road pitches. In the winter months, the Tuesday evening session will switch to indoors in the sports hall at Prestwich Arts College [Map]. 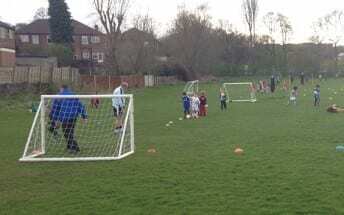 Sessions are split into smaller groups depending on your child’s age and will consist of coaching basic football skills like passing, shooting, dribbling, attacking, defending etc. The sessions also help your children gain valuable social skills like listening, talking, teamwork, sharing and taking turns. And of course, the opportunity to make new friends! The latter part of each session consists of a short football match in each group so the children can put in to practice the skills they have learnt. Our coaches are qualified to minimum Level 1 award in Coaching Football from the Football Association/1st4sport which includes FA Emergency First Aid and FA Safeguarding Children in Football. If you are interested in your child taking part or would just like some more information then please contact Craig Short on the telephone number or email address above.